For other uses, see Goodfellas (disambiguation). Goodfellas (stylized GoodFellas) is a 1990 American crime film directed by Martin Scorsese. It is an adaptation of the 1985 non-fiction book Wiseguy by Nicholas Pileggi, who co-wrote the screenplay with Scorsese. The film narrates the rise and fall of mob associate Henry Hill and his friends and family from 1955 to 1980. Scorsese initially titled the film Wise Guy and postponed making it; later, he and Pileggi changed the title to Goodfellas. To prepare for their roles in the film, Robert De Niro, Joe Pesci and Ray Liotta often spoke with Pileggi, who shared research material left over from writing the book. According to Pesci, improvisation and ad-libbing came out of rehearsals wherein Scorsese gave the actors freedom to do whatever they wanted. The director made transcripts of these sessions, took the lines he liked best and put them into a revised script, which the cast worked from during principal photography. Made on a budget of $25 million, Goodfellas grossed $46.8 million. It received positive reviews from critics and was nominated for six Academy Awards, including Best Picture and Best Director, with Pesci winning for Best Supporting Actor. The film won five awards from the British Academy of Film and Television Arts, including Best Film and Best Director. Additionally, Goodfellas was named the year's best film by various critics' groups. Goodfellas is widely regarded as one of the greatest films in the gangster genre. In 2000, it was deemed "culturally, historically, and aesthetically significant" and selected for preservation in the National Film Registry by the United States Library of Congress. Its content and style have been emulated in numerous other films and television series. In 1955, Henry Hill, a high school student, becomes enamored of the criminal life in his neighborhood, and begins working for Paul "Paulie" Cicero and his associates: James "Jimmy the Gent" Conway, a truck hijacker; and Tommy DeVito, a fellow juvenile delinquent. Henry begins as fence for Jimmy, gradually working his way up to more serious crimes. Enjoying the perks of their criminal life, the three associates spend most of their nights at the Copacabana nightclub, carousing with women. Henry starts dating Karen Friedman, a Jewish woman from the Five Towns area of Long Island. Karen is initially troubled by Henry's criminal activities, but is eventually seduced by his glamorous lifestyle. They marry, despite her parents' disapproval. In 1970, Gambino family member Billy Batts repeatedly insults Tommy at a nightclub owned by Henry. Enraged, Tommy and Jimmy attack and kill him. The murder of a made man would warrant retribution from the Gambinos; another made man, possibly even Paulie, would be forced to kill the perpetrators. Knowing this, Jimmy, Henry, and Tommy cover up the murder. They transport the body in the trunk of Henry's car, and bury it in upstate New York. Six months later, Jimmy learns that the burial site is slated for development, forcing them to exhume and relocate the decomposing corpse. A jealous Karen harasses Henry's mistress Janice and holds Henry at gunpoint. Henry moves in with Janice, but Paulie insists he return to Karen after collecting a debt from a gambler in Tampa with Jimmy. Upon returning, Jimmy and Henry are arrested after being turned in by the gambler's sister, an FBI typist, and receive ten-year prison sentences. In order to support his family on the outside, Henry has drugs smuggled in by Karen and sells them to a fellow inmate from Pittsburgh. In 1978, Henry is paroled and expands this cocaine business against Paulie's orders, soon involving Jimmy and Tommy. Jimmy organizes a crew to raid the Lufthansa vault at John F. Kennedy International Airport and take $6 million. After some members buy expensive items against Jimmy's orders and the getaway truck is found by police, he has most of the crew murdered. In his voiceover narration, as dead bodies are being discovered all over the city, Henry implicitly theorizes that Jimmy would have killed them anyway rather than share the profits of the heist. Tommy and Henry are spared by Jimmy. Tommy, however, is tricked into believing he is to become a made man and is ultimately shot dead in retribution for Batts' murder. By 1980, Henry has become a nervous wreck from cocaine use and insomnia. He sets up a drug deal with his Pittsburgh associates, but is arrested by narcotics agents and jailed. After bailing him out, Karen explains that she flushed $60,000 worth of cocaine down the toilet to prevent FBI agents from finding it during their raid, leaving the family virtually penniless. Feeling betrayed by Henry's drug dealing, Paulie gives him $3,200 and ends their association. Following a routine visit, Karen barely escapes a probable murder attempt by Jimmy. Henry meets Jimmy in a diner and is asked to travel on a hit assignment; the novelty of such a request makes Henry suspicious. Facing federal charges, and realizing Jimmy plans to have him and Karen killed, Henry decides to enroll in the Witness Protection Program, even though it means that Karen will not be able to see her parents. He gives sufficient testimony to have Paulie and Jimmy arrested and convicted. Forced out of his gangster life, Henry now has to face living in the real world. He narrates "I'm an average nobody. I get to live the rest of my life like a schnook." The end title cards reveal that Henry is still a protected witness and was arrested in 1987 in Seattle for narcotics conspiracy, receiving five years probation. He has been clean since then. After 25 years of marriage, Henry and Karen separated in 1989. Paulie died in 1988 in Fort Worth Federal Prison at the age of 73 from respiratory illness. Jimmy is serving a twenty-years-to-life sentence in a New York prison for murder and will not be eligible for parole until 2004, when he will be 78 years old. Goodfellas is based on New York crime reporter Nicholas Pileggi's book Wiseguy. Martin Scorsese did not intend to make another mob film, but he saw a review of Pileggi's book, which he then read while working on the set of The Color of Money in 1986. He had always been fascinated by the mob lifestyle and was drawn to Pileggi's book because it was the most honest portrayal of gangsters he had ever read. After reading Pileggi's book, the filmmaker knew what approach he wanted to take: "To begin Goodfellas like a gunshot and have it get faster from there, almost like a two-and-a-half-hour trailer. I think it's the only way you can really sense the exhilaration of the lifestyle, and to get a sense of why a lot of people are attracted to it." According to Pileggi, Scorsese cold-called the writer and told him, "I've been waiting for this book my entire life", to which Pileggi replied, "I've been waiting for this phone call my entire life". Scorsese decided to postpone making the film when funds materialized in 1988 to make The Last Temptation of Christ. He was drawn to the documentary aspects of Pileggi's book. "The book Wise Guys gives you a sense of the day-to-day life, the tedium, how they work, how they take over certain nightclubs, and for what reasons. It shows how it's done". He saw Goodfellas as the third film in an unplanned trilogy of films that examined the lives of Italian-Americans "from slightly different angles". He has often described the film as "a mob home movie" that is about money, because "that's what they're really in business for". Two weeks in advance of the filming, the real Henry Hill was paid $480,000. Scorsese and Pileggi collaborated on the screenplay, and over the course of the 12 drafts it took to reach the ideal script, the reporter realized "the visual styling had to be completely redone... So we decided to share credit". They decided which sections of the book they liked and put them together like building blocks. Scorsese persuaded Pileggi that they did not need to follow a traditional narrative structure. The director wanted to take the gangster film and deal with it episode by episode, but start in the middle and move backwards and forwards. Scorsese would compact scenes and realized that if they were kept short, "the impact after about an hour and a half would be terrific". He wanted to do the voiceover like the opening of Jules and Jim (1962) and use "all the basic tricks of the New Wave from around 1961". The names of several real-life gangsters were altered for the film: Tommy "Two Gun" DeSimone became the character Tommy DeVito; Paul Vario became Paulie Cicero, and Jimmy "The Gent" Burke was portrayed as Jimmy Conway. Pileggi and Scorsese decided to change the title of their film to Goodfellas because two contemporary projects, the 1986 Brian De Palma film Wise Guys and the 1987–1990 TV series Wiseguy had used similar titles. Once Robert De Niro agreed to play Conway, Scorsese was able to secure the money needed to make the film. The director cast Ray Liotta after De Niro saw him in Jonathan Demme's Something Wild (1986), and Scorsese was surprised by "his explosive energy" in that film. Liotta had read Pileggi's book when it came out and was fascinated by it. A couple of years afterwards, his agent told him Scorsese was going to direct a film version. In 1988, he met the director over a period of a couple of months and auditioned for the film. He campaigned aggressively for a role, but the studio wanted a well-known actor. He later said "I think they would've rather had Eddie Murphy than me". To prepare for the role, De Niro consulted with Pileggi, who had research material that had been discarded while writing the book. De Niro often called Hill several times a day to ask how Burke walked, held his cigarette, and so on. Driving to and from the set, Liotta listened to FBI audio cassette tapes of Hill, so he could practice speaking like his real-life counterpart. To research her role, Lorraine Bracco tried to get close to a mob wife but was unable to, because they exist in a very tight-knit community. She decided not to meet the real Karen, saying she "thought it would be better if the creation came from me. I used her life with her parents as an emotional guideline for the role". Paul Sorvino had no problem finding the voice and walk of his character, but found it challenging finding what he called "that kernel of coldness and absolute hardness that is antithetical to my nature except when my family is threatened". The film was shot on location in Queens, New York, New Jersey, and parts of Long Island during the spring and summer of 1989, with a budget of $25 million. Scorsese broke the film down into sequences and storyboarded everything because of the complicated style throughout. According to the filmmaker, he "wanted lots of movement and I wanted it to be throughout the whole picture, and I wanted the style to kind of break down by the end, so that by [Henry's] last day as a wiseguy, it's as if the whole picture would be out of control, give the impression he's just going to spin off the edge and fly out." He claims that the film's style comes from the first two or three minutes of Jules and Jim (1962): extensive narration, quick edits, freeze frames, and multiple locale switches. It was this reckless attitude towards convention that mirrored the attitude of many of the gangsters in the film. Scorsese remarked, "So if you do the movie, you say, 'I don't care if there's too much narration. Too many quick cuts?—That's too bad.' It's that kind of really punk attitude we're trying to show". He adopted a frenetic style to almost overwhelm the audience with images and information. He also put plenty of detail in every frame because the gangster life is so rich. The use of freeze frames was done because Scorsese wanted images that would stop "because a point was being reached" in Henry's life. Joe Pesci didn't judge his character but found the scene where he kills Spider for talking back to his character hard to do, because he had trouble justifying the action until he forced himself to feel the way Tommy did. Lorraine Bracco found the shoot to be an emotionally difficult one because it was such a male-dominated cast, and she realized if she did not make her "work important, it would probably end up on the cutting room floor". When it came to the relationship between Henry and Karen, Bracco saw no difference between an abused wife and her character. According to Pesci, improvisation and ad-libbing came out of rehearsals wherein Scorsese let the actors do whatever they wanted. He made transcripts of these sessions, took the lines the actors came up with that he liked best, and put them into a revised script that the cast worked from during principal photography. For example, the scene where Tommy tells a story and Henry is responding to him — the "Funny how? Do I amuse you?" scene — is based on an actual event that Pesci had witnessed. It was worked on in rehearsals where he and Liotta improvised, and Scorsese recorded four to five takes, rewrote their dialogue, and inserted it into the script. The dinner scene with Tommy's mother was largely improvised. Her painting of the bearded man with the dogs was based on a photograph from National Geographic magazine. The cast did not meet Henry Hill during the film's shoot until a few weeks before it premiered. Liotta met him in an undisclosed city; Hill had seen the film and told the actor that he loved it. The long tracking shot through the Copacabana nightclub came about because of a practical problem: the filmmakers could not get permission to go in the short way, and this forced them to go round the back. Scorsese decided to film the sequence in one unbroken shot in order to symbolize that Henry's entire life was ahead of him, commenting, "It's his seduction of her [Karen] and it's also the lifestyle seducing him". This sequence was shot eight times. Henry's last day as a wiseguy was the hardest part of the film for Scorsese to shoot, because he wanted to properly show Henry's state of anxiety, paranoia, and racing thoughts caused by cocaine and amphetamines intoxication. Scorsese said to movie critic Mark Cousins in an interview the reason for Pesci shooting at the screen at the end of the film: "well that's a reference right to the end of The Great Train Robbery, that's the way that ends, that film, and basically the plot of this picture is very similar to The Great Train Robbery. It hasn't changed, 90 years later, it's the same story, the gun shots will always be there, he's always going to look behind his back, he's gotta have eyes behind his back, because they're gonna get him someday." The director ended the film with Henry regretting that he is no longer a wiseguy, about which Scorsese said, "I think the audience should get angry at him and I would hope they do—and maybe with the system which allows this." Scorsese wanted to depict the film's violence realistically, "cold, unfeeling and horrible. Almost incidental". However, he had to remove 10 frames of blood to ensure an R rating from the MPAA. With a budget of $25 million, Goodfellas was Scorsese's most expensive film to date but still only a medium budget by Hollywood standards. It was also the first time he was obliged by Warner Bros. to preview the film. It was shown twice in California, and a lot of audiences were "agitated" by Henry's last day as a wise guy sequence. Scorsese argued that that was the point of the scene. Scorsese and the film's editor, Thelma Schoonmaker, made this sequence faster with more jump cuts to convey Henry's drug-addled point of view. In the first test screening there were 40 walkouts in the first ten minutes. One of the favorite scenes for test audiences was the one where Tommy tells the story and Henry is responding to him—the "Do I amuse you?" scene. While there is no incidental score as such in the film, Scorsese chose songs for the soundtrack that he felt obliquely commented on the scene or the characters. He only used music that could have been heard at that time. For example, if a scene took place in 1973, he could use any song that was current or older. According to Scorsese, a lot of non-dialogue scenes were shot to playback. For example, he had "Layla" (1970) playing on the set while shooting the scene where the dead bodies are discovered in the car, dumpster, and meat truck. Sometimes, the lyrics of songs were put between lines of dialogue to comment on the action. Some of the music Scorsese had written into the script, while other songs he discovered during the editing phase. Goodfellas premiered at the 47th Venice International Film Festival, where Scorsese received the Silver Lion award for best director. It was given a wide release in North America on September 21, 1990 in 1,070 theaters with an opening weekend gross of US$6.3 million. It went on to make $46.8 million domestically. On Rotten Tomatoes, a review aggregator, 96% of 92 surveyed critics gave the film a positive review; the average rating was 9/10. The site's critical consensus reads, "Hard-hitting and stylish, GoodFellas is a gangster classic – and arguably the high point of Martin Scorsese's career." Metacritic gave the film a weighted average score of 89 out of 100 based on 18 critics, indicating "universal acclaim". On CinemaScore, audiences gave the film an average grade of "A–" on an A+ to F scale. In his review for the Chicago Sun-Times, Roger Ebert wrote, "No finer film has ever been made about organized crime – not even The Godfather." In his review for the Chicago Tribune, Gene Siskel wrote, "All of the performances are first-rate; Pesci stands out, though, with his seemingly unscripted manner. GoodFellas is easily one of the year's best films." In his review for The New York Times, Vincent Canby wrote, "More than any earlier Scorsese film, Goodfellas is memorable for the ensemble nature of the performances... The movie has been beautifully cast from the leading roles to the bits. There is flash also in some of Mr. Scorsese's directorial choices, including freeze frames, fast cutting and the occasional long tracking shot. None of it is superfluous". USA Today gave the film four out of four stars and called it, "great cinema—and also a whopping good time". David Ansen, in his review for Newsweek magazine, wrote "Every crisp minute of this long, teeming movie vibrates with outlaw energy". Rex Reed said, "Big, Rich, Powerful and Explosive. One of Scorsese's best films! Goodfellas is great entertainment." Reed, Rex (September 24, 1990). "Goodfellas". New York Magazine. In his review for Time, Richard Corliss wrote, "So it is Scorsese's triumph that GoodFellas offers the fastest, sharpest 2½-hr. ride in recent film history." The film was ranked the best of 1990 by Roger Ebert, Gene Siskel, and Peter Travers. In 2012, the Motion Picture Editors Guild listed Goodfellas as the fifteenth best-edited film of all time based on a survey of its membership. Goodfellas is 39th on James Berardinelli's 2014 list of the top 100 Films. 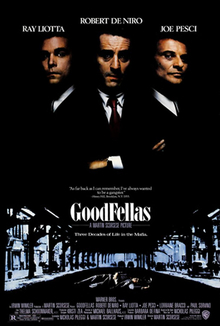 Goodfellas was released on DVD in March 1997, in a single-disc double-sided single-layer format that requires the disc to be flipped during viewing; in 2004, Warner Home Video released a two-disc, dual-layer version, with remastered picture and sound, and bonus materials such as commentary tracks. In early 2007 the film became available on single Blu-ray with all the features from the 2004 release; an expanded Blu-ray version was released in February 2010, bundled with a disc with features that include the 2008 documentary Public Enemies: The Golden Age of the Gangster Film. The film was released on 4K Ultra HD Blu-ray on December 6, 2016. Goodfellas is #94 on the American Film Institute's "100 Years, 100 Movies" list and moved up to #92 on its AFI's 100 Years... 100 Movies (10th Anniversary Edition) from 2007. In June 2008, the AFI put Goodfellas at #2 on their AFI's 10 Top 10—the best ten films in ten "classic" American film genres—after polling over 1,500 people from the movie-related community. Goodfellas was regarded as the second-best in the gangster film genre (after The Godfather). In 2000, the United States Library of Congress deemed the film "culturally significant" and selected it for preservation in the National Film Registry. Roger Ebert named Goodfellas the "best mob movie ever" and placed it among the best films of the 1990s. In December 2002, a UK film critics poll in Sight and Sound ranked the film #4 on their list of the 10 Best Films of the Last 25 Years. Time included Goodfellas in their list of Time's All-TIME 100 Movies. Channel 4 placed Goodfellas at #10 in their 2002 poll The 100 Greatest Films. Empire listed Goodfellas at #6 on their "500 Greatest Movies Of All Time". Total Film voted Goodfellas #1 as the greatest film of all time. Premiere listed Joe Pesci's Tommy DeVito as #96 on its list of "The 100 Greatest Movie Characters of All Time," calling him "perhaps the single most irredeemable character ever put on film." Empire ranked Tommy DeVito #59 in their "The 100 Greatest Movie Characters" poll. Goodfellas inspired director David Chase to make the HBO television series The Sopranos. Chase said "Goodfellas is the Koran for me." He also told Peter Bogdanovich: "Goodfellas is a very important movie to me and Goodfellas really plowed that ... I found that movie very funny and brutal and it felt very real. And yet that was the first mob movie that Scorsese ever dealt with a mob crew. ... as opposed to say The Godfather ... which there's something operatic about it, classical, even the clothing and the cars. You know I mean I always think about Goodfellas when they go to their mother's house that night when they're eating, you know when she brings out her painting, that stuff is great. I mean The Sopranos learned a lot from that." Indeed, the film shares a total of 27 actors with The Sopranos, including Sirico, Imperioli, Pellegrino, Lip, Vincent, and Bracco, who would later be cast in major roles in Chase's HBO series. July 24, 2010, marked the 20th anniversary of the film's release. This milestone was celebrated with Henry Hill's hosting a private screening for a select group of invitees at the Museum of the American Gangster, in New York City. In January 2012, it was announced that the AMC Network had put in development a television series version of the movie. Pileggi was on board to co-write the adaptation with television writer-producer Jorge Zamacona. The two would executive produce with the film's producer Irwin Winkler and his son, David. Luc Besson's 2013 crime comedy film The Family features a sequence where Giovanni Manzoni (De Niro), a gangster who is under witness protection for testifying against a member of his family, watches Goodfellas. De Niro plays a main character in Goodfellas. In 2014, the ESPN-produced 30 For 30 series debuted Playing for the Mob, the story about how Hill and his Pittsburgh associates helped several Boston College basketball players commit point shaving scandal during the 1978–79 season, an episode briefly mentioned in the movie. The documentary, narrated by Ray Liotta, was set up so that the viewer needed to watch the movie beforehand, to understand many of the references in the story. In 2015, Goodfellas closed the 2015 Tribeca Film Festival with a screening of its 25th anniversary remaster. ^ "Goodfellas (18)". British Board of Film Classification. September 17, 1990. Retrieved October 22, 2015. ^ a b c d e f g h i j k l m n Thompson, David; Ian Christie (1996). "Scorsese on Scorsese". Faber and Faber. pp. 150–161. ^ a b "Goodfellas". Box Office Mojo. Retrieved December 7, 2014. ^ Merrie, Stephanie (April 29, 2015). "'Goodfellas' is 25. Here's an incomplete list of all the movies that have ripped it off". The Washington Post. Retrieved March 12, 2017. ^ Vlastelica, Ryan (September 18, 2015). "Goodfellas turned Wiseguy's simple prose into cinematic gold". AV Club. ^ a b Malcolm, Derek (September – October 1990). "Made Men". Film Comment. ^ a b c Goodwin, Richard. "The Making of Goodfellas". Hotdog. ^ a b c d e f g Linfield, Susan (September 16, 1990). "Goodfellas Looks at the Banality of Mob Life". The New York Times. ^ a b c d Clark, Mike (September 19, 1990). "GoodFellas step from his childhood". USA Today. ^ a b c Kelly, Mary Pat (March 2003). "Martin Scorsese: A Journey". Thunder Mouth Press. ^ "The Making of Goodfellas". Empire Magazine. November 1990. Retrieved June 5, 2015. ^ a b c d Gilbert, Matthew (September 16, 1990). "Scorsese Tackles the Mob". Boston Globe. ^ a b c d Hughes, Howard. Crime Wave: The Filmgoers' Guide to the Great Crime Movies. pp. 176–177. ^ Portman, Jamie (October 1, 1990). "Goodfellas Star Prefers Quiet Life". Toronto Star. ^ a b Arnold, Gary (September 25, 1990). "Real Fellas Talk about Mob Film". Washington Times. ^ Wolf, Buck (November 8, 2005). "Rap Star 50 Cent Joins Movie Mobsters". ABC News. Retrieved June 24, 2007. ^ a b Papamichael, Stella (October 22, 2004). "GoodFellas: Special Edition DVD (1990)". BBC. Retrieved June 24, 2007. ^ Witchel, Alex (September 27, 1990). "A Mafia Wife Makes Lorraine Bracco a Princess". The New York Times. ^ Van Gelder, Lawrence (October 12, 1990). "At the Movies". The New York Times. ^ a b c d Kaplan, Jonah (writer and editor); Stephen Altobellow and Jeffrey Schwartz (producers) (2004). Getting Made: The Making of Goodfellas. Goodfellas (Blu-ray Disc)|format= requires |url= (help). Warner Home Video. ISBN 1-4198-4306-0. ^ Godfrey, Alex (November 2013). "Whaddya want from me?". mrgodfrey. ^ Malcolm, Derek (September 17, 1990). "The Venice Film Festival ends in uproar". The Guardian. ^ "GoodFellas (1990)". Rotten Tomatoes. Retrieved March 27, 2019. ^ "Goodfellas reviews". Metacritic. Retrieved October 18, 2014. ^ "GoodFellas". Chicago Sun-Times. September 2, 1990. Retrieved October 18, 2014. ^ Siskel, Gene (September 21, 1990). "Scorsese's 'Goodfellas' One Of The Year's Best". Chicago Tribune. Retrieved October 18, 2014. ^ Canby, Vincent (September 19, 1990). "A Cold-Eyed Look at the Mob's Inner Workings". The New York Times. ^ Ansen, David (September 17, 1990). "A Hollywood Crime Wave". Newsweek. ^ Corliss, Richard (September 24, 1990). "Married to the Mob". Time. Retrieved January 29, 2009. ^ a b "Siskel and Ebert Top Ten Lists (1969-1998)". Innermind.com. May 3, 2012. Retrieved August 14, 2014. ^ "Peter Travers' Top Ten Lists 1989-2005". caltech.edu. Retrieved August 14, 2014. ^ Berardinelli, James (2014). "Berardinelli's All Time Top 100". Reelviews.net. Retrieved April 20, 2017. ^ a b c d e "HFPA - Awards Search". Archived from the original on September 29, 2006. Retrieved August 27, 2014. ^ "47th Venice Film Festival". 1990. Retrieved November 3, 2013. ^ a b Gilchrist, Todd (February 10, 2010). "Making The (Up) Grade: Goodfellas". Moviefone. Retrieved August 27, 2014. ^ "AFI's 100 Years Movies: Ballot" (PDF). ^ "Best Films of the '90s". At the Movies with Ebert & Roeper. February 27, 2000. Archived from the original on August 8, 2007. Retrieved March 26, 2008. ^ "Modern Times". Sight and Sound. December 2002. Archived from the original on March 12, 2012. Retrieved August 27, 2008. ^ Schickel, Richard (February 12, 2005). "All-Time 100 Movies". Time. Retrieved January 29, 2009. ^ "The 500 Greatest Movies Of All Time". Empire. Retrieved December 2, 2008. ^ "Goodfellas named "greatest movie"". BBC NEWS. October 25, 2005. ^ "The 100 Greatest Movie Characters of All Time". Premiere. Archived from the original on March 17, 2008. Retrieved March 26, 2008. ^ "HBO: The Sopranos: Interview with Peter Bogdanovich". HBO. 1999. ^ "50 genius facts about GoodFellas". ShortList. Retrieved December 6, 2013. ^ "Goodfellas' Henry Hill Back in NYC for 20th Anniversary". WPIX-TV 11. July 24, 2010. Archived from the original on July 24, 2011. Retrieved October 9, 2010. ^ Andreeva, Nellie (January 10, 2012). "'Goodfellas' Series In The Works At AMC With Film's Nicholas Pileggi & Irwin Winkler". Deadline Hollywood. Retrieved January 16, 2012. ^ Bibbiani, William (September 11, 2013). "Exclusive Interview: Luc Besson on The Family". CraveOnline. Retrieved May 7, 2015. ^ 30 for 30: Playing for the Mob. ESPN. ^ Cox, Gordon. "'GoodFellas' Anniversary Screening, Event to Close 2015 Tribeca Film Festival". Variety.com. Variety. Retrieved March 18, 2015. Kelly, Mary Pat (2003). Martin Scorsese: A Journey. Thunder Mouth Press. ISBN 978-1-56025-470-6. Pileggi, Nicholas; Scorsese, Martin (1990). Goodfellas. Faber and Faber. ISBN 978-0-571-16265-9. Pileggi, Nicholas (1990). Wiseguy. Rei Mti. ISBN 978-0-671-72322-4. "Reel Faces: Fact vs. Fiction". Chasingthefrog.com.